Vigilant’s Hypo Risk Indicator alert warns of increased risk of severe blood glucose lows in the next 24 hours. 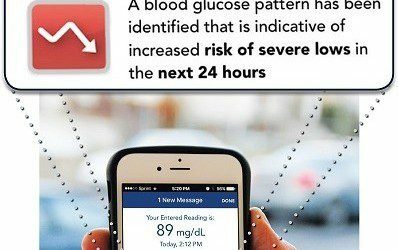 If you take insulin as part of your diabetes treatment regimen and live in fear of severe hypoglycemia (low blood sugar), you may be interested in Vigilant, a new diabetes app that can help you predict periods of high risk for lows. Created by InSpark Technologies, Inc., the app analyzes the data provided by traditional blood sugar monitoring, providing feedback about daily patterns of lows, highs, frequent swings, and monitoring frequency, along with patterns that indicate an increased risk of severe hypoglycemia in the next 24 hours. The app was developed jointly by engineers and scientists at the University of Virginia and InSpark Technologies and uses pattern-recognition tools supported by more than 20 peer-reviewed medical journal articles. The app is intended for use by people age 13 and older who use insulin pumps or are taking multiple injections of insulin each day. It is available for download to compatible smartphones in the Apple App Store and Google Play. For those with compatible phones, the app can also be connected to the Accu-Chek Aviva Connect blood glucose monitor so that monitoring data is wirelessly sent to the app. For people who care for someone with diabetes, Vigilant Caregiver, a web-based caregiver version of the app, is also available. The app is free for a limited time to a limited number of users, and will be accessible by a monthly subscription fee once the free period has ended. To learn more, visit the Vigilant website. Weight is not just about “calories in, calories out.” Bookmark DiabetesSelfManagment.com and tune in tomorrow to learn about four other factors that impact weight from nurse David Spero.